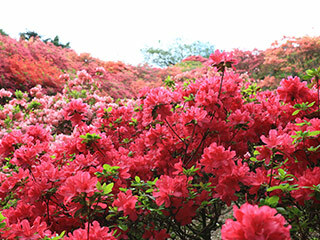 Kasama Tsutsuji Garden (笠間つつじ園) is one of the best Azalea spot located in Ibaraki Prefecture. There are 25 kinds 8,500 Azalea trees on the small mountain. It has a breathtaking view with fully colored hills by Azalea flowers. Azalea blooms from the end of April to May. During the season, there are many events held in this garden. Period: from the middle of April to the end of Golden week. 1. use JR Mito Line to Kasama. 2. use local bus to Nichido Museum. Kasama Azalea Garden is an Azalea park located in Kasama, Ibaraki Prefecture. There are 25 kinds 8,500 Azalea trees on the small mountain. The variation of the colors is so rich and beautiful. From dark red to white pink flowers blooms in the end of April to the early May. This park is located on the 143m tall small mountain that also has a great view of Kasama. From the top of the mountain, you can see the beautiful red carpet of Azalea flowers.